John Marks Templeton wanted Christians to be “humble” about the Bible and look to Science for direction. And his Foundation is handing out millions to groups trying to mesh Science with Religion. Sir John Marks Templeton (1912-2008) is best known as the creator of the Templeton Growth Fund, an investment fund established in 1954, which made him a very wealthy man. Two years before his death in 2008, Templeton found himself in 129th place on the Sunday Times‘ “Rich List” of the wealthiest Brits. But Templeton was not only an investor and moneymaker; he was also well-known as a philanthropist, through the work of his charitable organization, the Templeton Foundation. Established in 1987, the $3 billion Templeton Foundation offers over $70 million worth of research grants each year. The Foundation is currently headed by Templeton’s daughter, Heather Templeton Dill, and it is an important source of funding for organizations that include the BioLogos Foundation and the Canadian Scientific and Christian Affiliation. 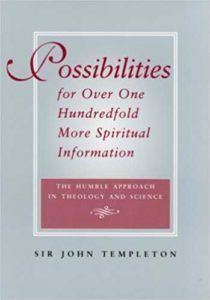 One of the Templeton Foundation’s purposes is to advance what Templeton called “humility-in-theology.” This was the subject of his book, published in 2000, Possibilities For Over One Hundredfold More Spiritual Information: The Humble Approach in Theology and Science. “…every two centuries…by encouraging people of all religions to become enthusiastic (rather than resistant) to new additional spiritual information, especially through science research, to supplement the wonderful ancient scriptures” (p. 180). “Although we seem to be the most sophisticated species at present on our planet, perhaps we should not think of our place as the end of cosmogenesis. Should we resist the pride that might tempt us to think that we are the final goal of creation? Possibly, we can become servants of creation or even helpers in divine creativity. Possibly, we are a new beginning, the first creatures in the history of life on earth to participate consciously in the ongoing creative process” (p. 41). “Do theologians need to be humble and open-minded? Leaders may be tempted to think that conformity and control are required for the orderliness of religion and for faithfulness. Most religions have developed creeds, doctrines, dogmas, liturgy and hierarchies of laypeople and clergy. Order and tradition of course do help groups to live as an organization of people whose ideals are compatible and link together the generations in mutual ideals. However, because of a lack of humility, have we observed throughout the history of most religions a tendency for dogma or hierarchy to stifle progress? If the members and clergy become more humble, could they re-form dogma in a more open-minded and inquiring way as a beginning point for continual improvements?” (p. 41). “Let none of us have any quarrel with any theologian. Let us happily admit that his or her concepts and doctrines may be right. But let us listen most carefully to any theologian who is humble enough to admit also that he may be wrong – or at least that the door to great insights by others is not closed. Let us seek to learn from each other. Let us try to use sciences to help verify or falsify new concepts. Let us always keep trying many methods to discover over 100 fold more about divinity” (p.50). “Egotism has been a major cause of many mistaken notions in the past. Egotism caused men to think that the stars and the sun revolved around them… that mankind was as old as the universe. Egotism is still our worst enemy. In fact, things are still not what they seem. Only by becoming humble can we learn more… Are those who believe only what they see pitifully self-centred and lacking in humility?” (p. 59). “Many religious concepts come directly or indirectly from ancient scriptures. An unavoidable limitation of utilizing such texts as a total basis for contemporary faith is that they were written within a context which may no longer be appropriate for ours today. Recent sciences reveal a universe billions of times larger and older and more complex than the one conceived by the ancients. The creative challenge is to enrich understanding and appreciation for the old with a welcoming of concepts and perspectives which may represent truly new insights and creative improvements, which can leverage the power of the past into a forward-looking adventure of learning more and more about the wonders of god and his purposes through ongoing creativity. Can it be an inspiring challenge to read the Bible in this way, which can help each generation of god’s people to search for far more of divine realities than can ever be contained in the language and thought patterns of any age? Should we not be able to give a fuller and wider interpretation of divine revelation today, now that the range of our understanding of the universe has been so vastly enlarged? Why should we often try to express spiritual truths using obsolete words, limited concepts and ancient thought patterns? If some scholars think that Jesus himself wrote nothing, could this suggest that what he had to teach should not be frozen into words, even in his own age? Thus, he did not limit for future generations their range of spiritual concepts and research” (p. 47-48). The sad fact is, however much one claims to be “an enthusiastic Christian,” believing that the teachings of religions that deny Christ can be positively appropriated by a Christian makes one, for all intents and purposes, anything but. “Traditional pantheism can serve a useful purpose in suggesting the co-terminacy of spirit and matter and a personal relationship between the creator and creation. But it may not be compatible with the Christian concept of a personal god vastly greater than material things and who loves all of us and numbers the hairs of our heads. Profound mutual indwelling between man and divinity may be better stated by the Unity School of Christianity, ‘God is all of me: and I am a little part of him.’ Such a notion implies an inseparable relationship between god and us. As even ‘a little part of him,’ we may realize the mutual unity of god and his creation. We may conceive that our own divinity may arise from something more profound that merely being ‘god’s children’ or being ‘made in his image'” (p. 86). “…Millions of intellectuals the world over have become disenchanted with backward-looking religious institutions… In order to recapture the great thinking minds of the world, the clergy must turn their heads 180 degrees from past to future. With feet planted squarely in the present and eyes directed to the future, leaders can find factual bases in science for viable, solid, dynamic doctrines. For science and rationality are enemies not of religion – only of dogmatism” (p. 47). “It is still my bet that at several points in the next few years and decades the traditional theological and religious communities will find the scientific revelations a gold mine, and that by early in the third millennium A.D. a fantastic revitalization and universalization of religion will sweep the world. The ecumenical power will come from a universalized and credible theology and related religious practices, not from the politics of dying institutions seeking strength in pooling their weaknesses. I cannot imagine a more important bonanza for theologians and the future of religion than the information lode revealed by the scientific community… It provides us with a clear connection between human values, including our highest religious values, and the cosmic scheme of things. My prophecy, then, is that God talk, talk about the supreme determiner of human destiny, will in the next century increasingly be fostered by the scientific community” (p. 103). In the conclusion of his book, Templeton lists a number of the “founder’s favorite charities,” which also provides real insight into Templeton’s agenda. generally accentuating the positive ideas and attitudes and avoiding the negative” (p. 183). Such were the goals of Sir John Marks Templeton, and such are the goals of his foundation. A serious examination of Templeton’s guiding philosophy, and the philosophy of the Templeton Foundation, in the light of Scriptural principles, should lead us to a sense of genuine concern about any organization that the Foundation chooses to support financially. And it should lead us to question the ultimate motivation behind this support, and the fruits that this foundation is bearing in the numerous organizations that receive its funding. “The Humble Approach” of Sir John Marks Templeton has absolutely nothing in common with the genuinely humble approach of the Lord Jesus Christ. Templeton’s utopian vision has nothing in common with the eschatological vision of God’s Word. Now, those who receive large amounts of financial support from the Templeton Foundation may do so “with no strings attached,” and perhaps some recipients may be unaware of the totality of the Foundation’s founder’s spiritual vision. But could it be that they are unwitting victims of a larger, and more nefarious, agenda, which has at its base a desire to proclaim a different gospel, by denying the explicit teachings of the Lord Jesus Christ and his exclusive claims? We are warned against keeping company with the wicked (1 Cor. 15:33, Psalm 1:1, Prov. 13:20) and it doesn’t seem that much of an extension to think how this applies to accepting funding from a group with a wicked agenda. Other grants have been made to train Roman Catholic teachers and preachers to engage the dialogue between science and religion, to promote science engagement in rabbinic training, and to measure science engagement in Roman Catholic high schools and seminaries. Among a number of other Christian theologians, Niels Henrik Gregersen, professor of Systematic Theology at the University of Copenhagen, received a Templeton research grant for his work on the constructive interface between science and religion. What can we learn from all of this? If we were unaware of the foundational principles behind the Templeton Foundation, perhaps all of this would appear to be somewhat innocuous. After all, who could argue against Christians being involved in the sciences? Why oppose efforts aimed at developing “scientific awareness”? Certainly we shouldn’t want to bury our heads in the sand, and ignore what the sciences have to offer, as if science were somehow “off-limits” to the faithful Christian, should we? But remember this important fact: the Templeton Foundation has a very clear agenda – a utopian, panentheistic philosophy that has an ecumenical goal of uniting the religions of the world around a synthesis of “science” and religion, with “science” seated firmly in the driver’s seat in this relationship. This agenda is being promoted by the lavish dispersal of funds to Islamic, Roman Catholic, Jewish, and other religious organizations, including, sadly, many evangelical Christian groups, many of which are making their influence felt in Reformed churches as well. Two popular sayings come to mind: “Follow the money,” and “He who pays the piper calls the tune.” The money trail leads us to Sir John Marks Templeton. And clearly, Templeton’s agenda is making headway in many places, although it is also clear that this agenda faces many obstacles. First of all, there is reluctance to accept the premises of this movement among religious organizations, as can be seen from the numerous grants being made to support efforts to decrease the resistance of religious leaders and members of religious groups, including evangelical Christians, to this religious/scientific paradigm. But that reluctance is being overcome, as the Templeton agenda makes inroads through a judicious use of funding. Efforts to reach youth, and those who teach the young, are effective means of dissemination for any propaganda effort, whether political, cultural, or religious in nature. Young people are more easily influenced, and they are most definitely being targeted, in a well-funded, concerted effort. But there is also resistance from the other side – from unbelieving scientists who reject all religion, any idea of transcendence, and the idea that anything exists beyond the physical. This group is also being addressed by the outreach efforts of the Templeton Foundation, as it works toward fulfilling its long-term goals. A spiritual war is being waged against God’s people, using that ancient question, “Has God really said?” This is not novel; every generation of Christians faces this reality, in different ways at different times in history. The battle is being played out in a world in which money talks, and a lot of money talks loudly. We cannot afford to be naive on this issue. That’s why we need to be on our guard against the influence of the Templeton Foundation’s money, even if it’s being spent by organizations that may have been respected among us. That money is being spent to promote an agenda that is radically different from the agenda of God’s kingdom. Our allegiance to the One True God must lead us to reject alliances with organizations like the Templeton Foundation, whose agenda is completely incompatible with that of our great God and Savior, Jesus Christ. Rev. Jim Witteveen also blogs at CreationWithoutCompromise.com where this article first appeared in two parts. The project originally began as a way to track the activity and funding of BioLogos. Many of the individuals listed in the chart, after their funding runs out, can also be found working for other organizations also receiving Templeton Foundation support! I try to update it every few months. Use the control key and + or – to expand or contract the chart.